ust over thirty years ago, in September of 1985, I was awarded the organ scholarship to Clare College, Cambridge, which would result in my spending three years as an undergraduate at Cambridge University from 1986 to1989. The transformative experiences I gained in that position are too many to recount. However, one of the moments that stays with me from my audition and interview was when Tim Brown, the director of music at Clare, presented me with the choir’s latest recording. 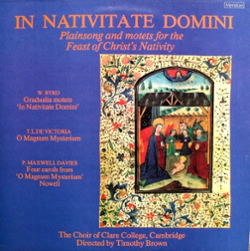 It was an LP of music by William Byrd, T. L. da Victoria, and Sir Peter Maxwell Davies entitled In Nativitate Domini. I remember being intrigued by the repertoire on the disc and noticed how well the two different compositional periods complemented each other. Whether consciously or subconsciously, I followed this model when I formed Tiffany Consort in New York City. We would program concerts with music by composers of the same nationality who lived several centuries apart: Thomas Tallis and Michael Tippett, William Byrd and Benjamin Britten, Guillaume Machaut and Francis Poulenc, John Taverner and John Tavener, and so on. For this season’s Boston Cecilia December concert, I will pair the composers William Byrd and Francis Poulenc. I am returning to the William Byrd motets from his Gradualia II, which I heard on the Clare Choir recording thirty years ago. This time, the Byrd motets will alternate with Poulenc’s well-loved Quatre Motets pour le temps de Noël. Personally, I enjoy the ebb and flow this creates with regard to elements of texture, tonality and mood, as well as the more predictably contrasting—even jarring—harmonic and stylistic language of the two composers. Also on the program is Edward Naylor’s Vox Dicentis. Naylor was organist of Emmanuel College, Cambridge, and he wrote this sumptuous piece of choral music in 1911 for the choir of King’s College, Cambridge. My first memory of this piece was a performance by Clare Choir in Trinity College Chapel, Cambridge! With carols arranged and composed by two great musicians associated with Cambridge, Sir David Willcocks (King’s College), who died last month, and John Rutter (Clare College) who celebrated his 70th birthday last month, this concert could quite appropriately be titled The Cambridge Connection! However, there is more to the program than these offerings, including The Brookline Connection. Last year, Charlie Evett, longtime member of Cecilia, commissioned me to compose music for two of his father’s poems. David Evett was deeply involved in the life of All Saints Church in Brookline, where he also sang in the choir. Charlie will write more in the next blog in this series regarding his father’s life and poetry, but I am pleased to announce that the December concerts will include first performances of both God’s Dream and His Unresisting Love, the latter being the text from which this concert takes its title. Both pieces are written for unaccompanied chorus. This program brings together many styles and musical moods, and I hope that it does so in a way that will take the listener on a journey. Each of the texts exhibits elements of mystery, questioning, insecurity, wonder, doubt, and joy. Some of the music will be instantly appealing. Some will require further listening. My hope is that the program as a whole will capture the feelings that can only be achieved through the great mystery of musical expression. You can listen to the 1985 Clare College Choir recording of the William Byrd motets here.